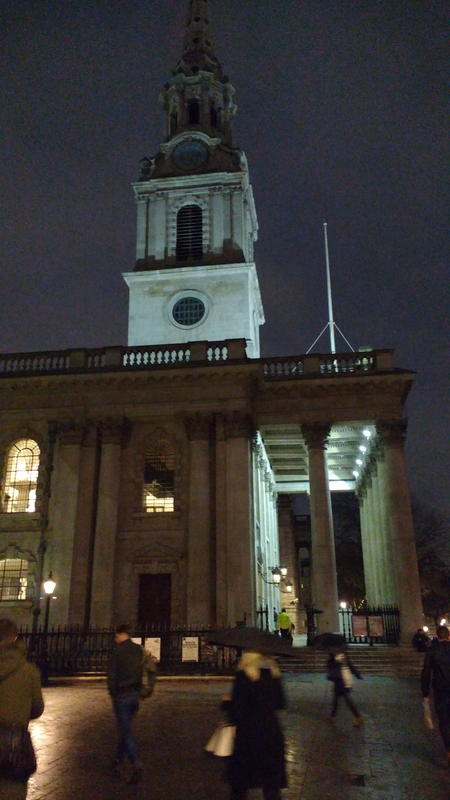 St Martin-in-the-Fields, taken last week. It’s not often that I write much about my PhD research on my blog. Part of that is a nervousness of opening the oven door before the cake is cooked, part of it a feeling of responsibility to hone my AHRC-funded research into well-formed work before letting it loose. But last night I experienced something as a punter, so to speak, that changed all that, and caused me to think about my research in a different way. It also made me realise why I have quickly grown to love St Martin-in-the-Fields so much. It was the day of the terror attack in Westminster, and I was due to go to St Martin’s for the 6.30 service, and then to a Lent group that I’d joined as something positive to do in addition to my self-imposed 40-day exile from Facebook. I was having a frustrating day working on my thesis: I just looked at the last draft that I’d cut and pasted together months ago, and despaired. The enthusiasm I’d felt for going to the Lent group when it first started was waning, because I was having a bad day—maybe I’d be better off staying at home and working. St Martin’s is only walking distance away from Westminster. Maybe I shouldn’t go. Maybe there’ll be chaos. Maybe it’ll be dangerous. I’m not so gung-ho about going out when danger is imminent; you won’t find me saying I’m not scared. But I’d committed to the Lent group, that was the whole point. Turning up was important. So I turned up. And during the distributing of the bread and wine, the pianist started playing, and I recognised within a few beats that it was Fauré’s Cantique de Jean Racine. Or rather, I recognised that the music was Fauré before I realised that it was the Cantique, because the introduction does what Fauré does so characteristically—to insert tiny melodic detours into an otherwise normal accompaniment, tiny burrs in the harmonic texture. You don’t notice the detail itself (unless you have to play it; then you notice it because it takes care and expert attention), you only notice its effect, like those pictures made up of thousands of smaller pictures that you cannot see unless you go up close. The introduction to Fauré’s Cantique de Jean Racine. Those little passing minor seconds make Fauré Fauré. I could hardly believe my ears. Surely they weren’t going to sing that, here, now, for us? But they did. I know every bar of that music, not as a performer, but as an enraptured listener. I first heard it when I was about 17, playing bass in the Hampshire County Youth Orchestra. We were going to accompany a choral society, and Gary Holmes, the conductor, told us a bit about the music: it was a lovely piece that people often chose for weddings. When you’re seventeen, and you’re playing this music in a full orchestra, with a large choir, it envelops and enthrals you in a way that rarely comes again, but the effect is lifelong. I have loved this music ever since then, and last night. I gave thanks inwardly for all the chances that made that happen, including the casual remark of a conductor that shaped the way I greeted the music then and forever after. The Choral Scholars of St Martin’s in the Fields, barely more than a handful of singers, performed this with such warmth, breadth, commitment and unmannered beauty, I could hardly contain the joy it gave me. At those Bread for the World services on Wednesdays, you gather for the eucharist in a circle near to the altar. I was standing just a few feet away from them, amazed that people just like you and me, dressed in normal day clothes (no choir robes, no ceremony, no fancy outfits) can stand there and produce this miracle of sound. I’m a musician myself, and maybe for that reason it’s actually very rare that I perceive it as extraordinary, or can enjoy it. But last night was different, and I suddenly wondered whether I understood, after all, one of the things that has mystified me about the people I’m writing about in my research. I have interviewed many dancers and teachers, and had many ad hoc conversations about music. There is something a bit strange about the ballet world: she shall have music wherever she goes, I often think to myself. In a world where it would be so easy to use recorded music like everyone else, you still find pianists used for class. It’s expensive. It’s difficult, and yet they still do it. Sometimes teachers nearly bankrupt themselves by paying for pianists when there are only a few people in the class, and as you walk past the studios, you think, why don’t they just use a CD? And when I ask them why, they say things like I don’t know. It’s nice to have a pianist. I don’t know why. It’s just nice. One of the things I’ve had to consider is whether to elevate this remark into something meaningful like Dora’s “it depends” in Antoine Hennion’s article on taste , or to wonder whether pianists are a kind of luxury that doesn’t bear scrutiny easily, like having a butler. Last night, however, as I looked across at the singers, I found myself thinking the same: This is nice. I thought of all the things that made this experience difficult: they need to rehearse, they need to turn up, they need to be present for other people not just as musicians, distanced from their audience, but participating with them in these rituals. I thought of all the organising, the structures, the planning, that had to be in place for this to happen, right down to getting the scores to sing from, and putting them away afterwards. There are multiple performances going on, and they have to do all of them well. In that sense, there is something about being there and singing that is caring. It’s being there for someone else, doing your thing, and doing it well, and perhaps not even being appreciated properly (though in fact, the vicar did thank them at the end, and you could see that they were delighted to have been acknowledged). I’ve also been quietly in awe from week to week, as another musician, of the improvisations of the pianist as he closely watches the progress of the eucharist, playing appropriate, thoughtful music to ease the transitions and cover the gaps. It’s familiar territory for me, however different the context. I wondered to myself whether this is something of why live music in ballet classes means so much to people. It’s not even about what the pianist plays, though that can be part of it. It’s about the fact that they’re there, they turned up, and they did something for you. It might in truth be not that difficult for them, but for you it was magic. Or they may have struggled against lethargy or competing demands to get there, but you have no idea of that; it made your evening. You can’t explain these things in terms of music, or Philip Auslander’s “liveness” , much as I admire and refer to his work. Why you can’t is what I’m grappling with in my thesis, as I discuss the way that dancers and teachers think about these things, and now I find that I am no more able to explain my own joy than anyone else’s, but I don’t want it taken away from me. As the service ended, they sang Verily, verily I say unto you by Tallis, like an afterthought, as if it was nothing at all, though of course, it was everything. There was a brief pause, and then they left, and the congregation began to disperse and talk. I looked over, and noticed one of the singers adjust her brightly coloured trainers, smile, turn and go. Just another Wednesday in London. It was the kind of moment that Daniel Stern describes in Forms of Vitality , where a whole world is contained in a moment that we know in all its complexity, instinctively, immediately, but could spend a lifetime trying to put into words. I guess I should know by now, considering how long I have been trying to write about music in everyday life that it might be the everydayness of some musical experiences that makes them special, but it took Fauré and those trainers to make me realise it. And as it happens, that moment also captures just something of what I love so much about St Martin’s. This entry was posted in Music, Personal and tagged Auslander, Church music, Fauré, Hennion, Liveness, Music, St Martin-in-the-Fields, Taste on March 23, 2017 1:10 pm by Jonathan Still.